SKU: N/A. Tags: Flav Watermelon Belts, Flav Watermelon Belts Edibles, FlavRX Gummies, FlavRX Sour Gummies, marijuana edible, Marijuana Edible Gummy. What are Flav’s Watermelon Belts? Watermelon is a refreshing, fun, near novel flavor in the edibles industry. These sweet and sour ones by Flav make medicating with cannabis accurate, easy, and most enjoyable. Coated in sugar, each belt contains 10 milligrams of THC, ensuring dosing is comfortable and without complications. However, effects are not immediate. It may take an hour, perhaps even two, for you to feel them. When effects hit, you will certainly notice. Infused from a well-balanced hybrid strain, you get the best of both its Sativa and Indica characteristics. The initial “high” is energizing and uplifting, but as the buzz starts to wear off, a relaxing sleepiness washes over you. Because of its potency, experts warn against eating too many belts too quickly, especially if you are a newbie. Too much THC can be unpleasant. Medicinally, these potent edibles offer an array of valuable properties. Flav extracts only the purest concentrate, rich in THC, CBD, and other crucial cannabinoids. Its Watermelon Belts have anti-inflammatory, anti-anxiety, analgesic, antiemetic, anti-seizure, anti-spasmodic, antioxidant, and other important therapeutic applications. Patients use them to treat an array of ailments. 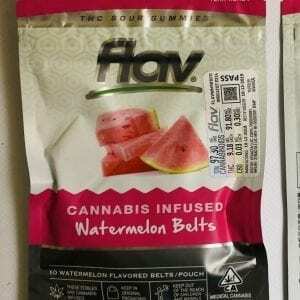 Anyone can enjoy these Watermelon Belts by Flav, both medical and recreational users. They are potent, tasty, and abundant in healthy benefits.